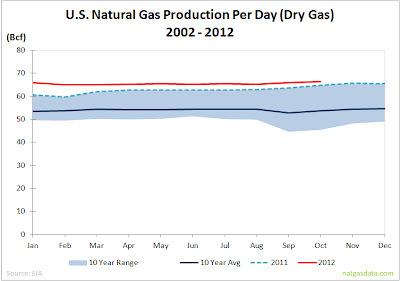 Last week, the EIA released its monthly production and consumption data for natural gas through October 2012. 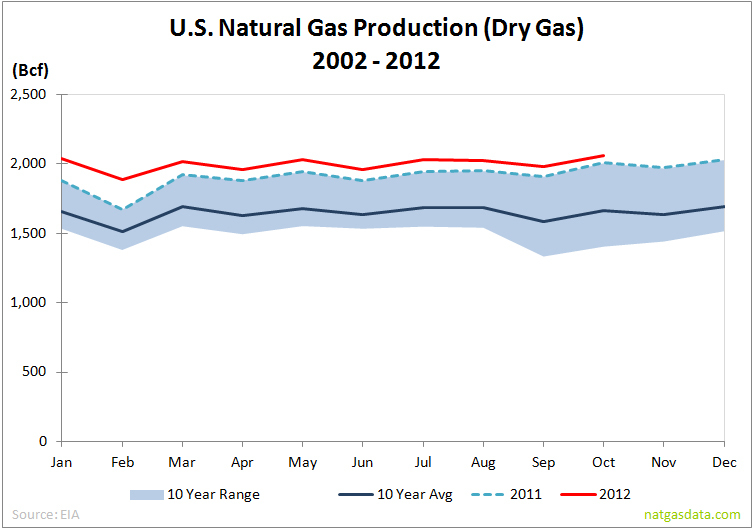 Total dry gas production in October was 2.058 Tcf, bringing the total gas produced YTD to 19.979 Tcf. 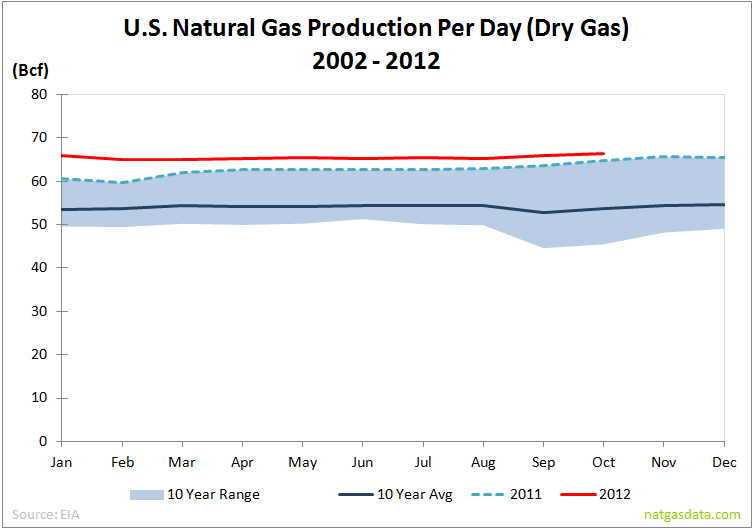 October 2012 production was 50 Bcf, or 2.5%, higher than October 2011, and YTD production was 980 Bcf, or 5.2%, above the same period last year. 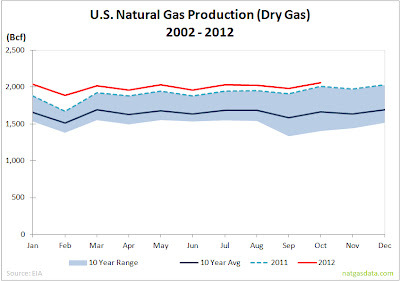 Compared to the ten year average, current YTD production is 3.553 Tcf, or 21.6%, higher. Looking at the numbers on a per day basis smooths them out but still shows that the current YTD production level is 3 Bcf/day greater than last year. Consumption data also remained higher than last year's figures and historical averages. 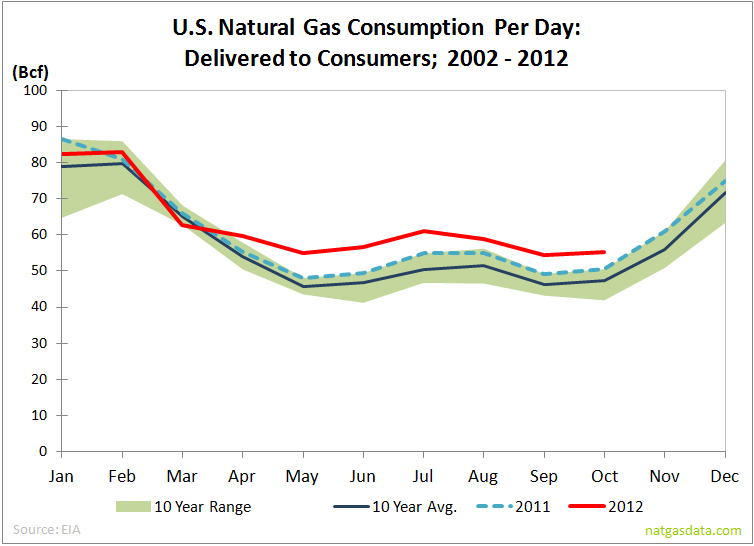 Total gas delivered to consumers in October 2012 was 1.716 Tcf, which was 149 Bcf, or 9.5%, higher than October 2011. 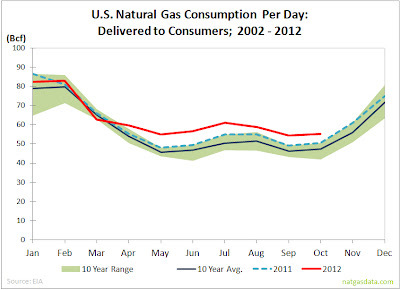 YTD deliveries were 19.085 Tcf, which was 1.02 Tcf, or 5.6%, above the same period in 2011. Compared to the ten year average, YTD consumption is 1.936 Tcf, or 11.3%, higher. Looking at consumption on a per day basis shows that YTD 2012 average daily deliveries were 62.6 Bcf, which was 3.1 Bcf, or 5.3%, above the same period last year. 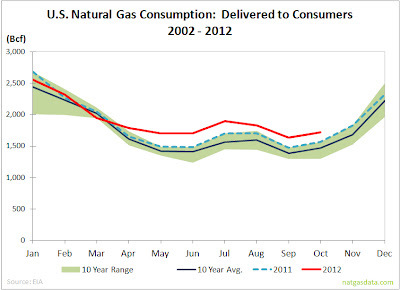 Bottom line: consumption is running well above average, but so is production. Production has been virtually flat this year, but it is still running at stubbornly high levels.